Allow your customers to edit product parameters (e.g. a shoe size) when they are already in the shopping cart. Works for simple product custom options, configurable or bundled products. 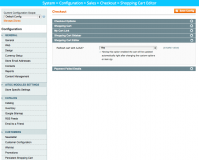 Why Use Shopping Cart Editor? Provide a smooth shopping experience with an editable cart. Let customers easily correct their mistake if they picked the wrong size, etc. Make it easy for shoppers to add the product parts they forgot (for bundled products). By installing the extension at their stores, online retailers provide buyers with an opportunity to make changes to the cart at any point of the shopping cycle. This makes the overall process more convenient and easy, providing for a great shopping experience that your customers will really enjoy and appreciate. Shopping cart abandonment rates are rising, so merchants have to prevent any possible inconvenience that may force customers to leave the website. By allowing them to easily change the number of products and their configurations in cart, you improve customers’ impression with your store, significantly increasing the chances of a purchase. With the help of the extension, customers will be able to pick up additional items for bundled products in the cart. Such an option will allow them to add relevant or frequently bought goods to their order, if they want to, resulting in a higher order value. 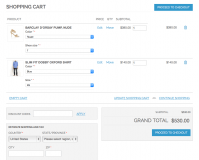 Improve user experience with an editable shopping cart. Keep more shoppers in the cart and reduce abandonment rates. Allow customers to change such product details as size, color, etc. Allow to edit custom options in shopping cart. 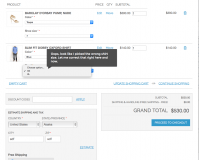 Allow to edit configurable product options in cart. Allow to edit bundled product options in cart. 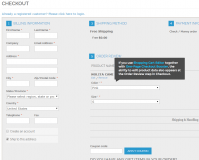 Refresh the cart with AJAX if product options or quantity change. Compatible with Custom Options Templates Magento extension. Compatible with Product Units and Quantities Magento extension. Compatible with any Checkout Optimization extensions by Aitoc. When used with One-Page Checkout Booster, Shopping Cart Editor allows you to set up a flawless checkout page, merged with the shopping cart, from which customers cannot escape! Magento Advanced Reports - Get a full insight into your customers and processes with the help of actionable analytics. Front-End Editor for Magento - Update product information, static blocks and pages on the front-end view. .
Magento Delivery Date plugin - Ensure timely delivery with advanced delivery schedule management. * Fixed the issue of compatibility with Custom Options for Grouped Products: it duplicates content of the cart when changing option value. * Fixed the issue with a product image size in the cart. * Fixed the design issues on Magento CE 1.9.0.0 and higher. * Fixed an issue with the form submission for the estimate shipping and tax box are broken when refreshing the cart with AJAX. * Fixed an issue with the custom option type 'file'. * Fixed an issue when using multi-select type of custom options with empty value. * Issue with incorrect quantity in the cart is fixed. * Compatibility with One-page Checkout Booster (ver. 1.4.10+): Issue with the deleted product options at the cart is fixed. * incorrect behavior of extension with the deleted product option is fixed. + Compatible with Custom Options Templates v.3.2.6+. * Ajax bugs in cart with some types of the products are fixed. * Fixed the issue with saving Area and Field data. + Updates the cart with help of AJAX when a customer selects another custom option's value or changes the quantity of an item. * Fixed bug with incorrect error message displaying when reducing qty. * Minor design bug fixed. * Not displaying of the product options when viewing order details from an admin area is fixed (actual for Magento CE of the ver. 1.4.0.x+). * Fixed compatibility issue with Recurring Purchase Assistant. + Compatible with Magento CE 1.6.1.0. + Compatible with Magento 1.5.0.1. * Issue with a grouped product being replaced with one of its compounded products is fixed. Works out of the box without any problems at all. This is a very useful extension and have bought it for several sites. It was easy to installed and and meant we did not need to clutter the product view page with all the options. Good Extension. Finally my clients can edit shopping cart. Extension is good and useful. Support is fast. After I buy this module i Can't display it in my custom template How can I solve it and it work only with default template. Please, submit a ticket for our support. And we'll find the Way to solve the issue. I had a little problem during installation, support responded quickly and and fixed the issue within hours. Turns out it was a code 18. Good extension, Great support, I recommend.